It’s 04.15 on the night of January 20. The fire breaks out on the second floor. The building’s wooden front goes up like matchwood. Sixty people are trapped inside. For many, jumping from the window is the only way out. The toll is heavy: two dead, twenty-five injured, four seriously. So what was the cause of the incident? Two weeks before the tragedy, holiday makers were alarmed by threats. Because of a broken romantic relationship, it is said a man promised he would burn the whole place down. However, the firefighters also found an automatic machine pistol at the foot of the building. Loaded with nine bullets. A type of weapon normally used by serious criminals. Accident or crime, the parents of Ambre, one of those seriously injured, like others close to victims, are impatient to know the truth. 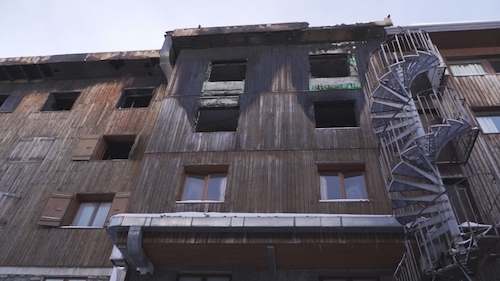 An investigation into a mysterious fire at Courchevel.